The Minato Ward City Azabu Regional City Office never disappoints! 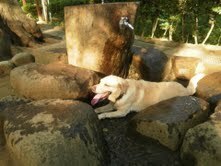 Look what I found this morning in Arisugawa Park while watering Pippi! 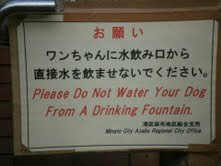 Admittedly it is a bit inappropriate to allow dogs to drink from the fountains (but it sure is cute!). Fortunately Pippi prefers the spigot below or, better yet, the basin catching the run off.